The sharpening of curves and complex shapes, such as carving chisels, gouges, or molding plane irons, requires specially shaped stones intended for this purpose. These are called slip stones, or carvers's slips. For most people, a Norton gouge stone and two or three Norton slip stones will be enough to get by. For people also dealing with complex molding planes and carving chisels, it is convenient to have an even more complete selection of Norton slip stones. 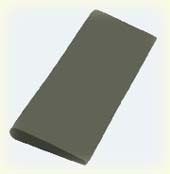 We offer a comprehensive selection of Norton slip stones, which should cover any complex sharpening needs. Or for those of you who want the last word in Norton slip stones, we offer the Norton Woodworker's Slip Roll, which comes with 27 different Norton slip stones in a fitted roll. We are discontinuing Norton products and are closing out our remaining inventory. This type of slip is another one of the stones that every serious woodworker has at least a few. We offer the full line of Norton slips. The two slips marked with an asterisk are the two we recommend starting with. The sizes of the stones vary between the Crystolon and Hard Arkansas stones, so that small in one is not the same as small in the other. This was done intentionally to make the range more versatile. Norton MJS-24 Crystolon Medium Grit 4 1/2 x 1 3/4 x 1/4 x 1/16 SALE! Norton MJS-44 Crystolon Medium Grit 4 1/2 x 1 3/4 x 1/2 x 3/16 SALE! Norton FS-14 India Fine Grit 4 x 1 x 7/16 x 3/16 SALE! Norton FS-15 India Fine Grit 5 x 1 x 5/16 x 3/32 SALE! Norton FS-34 India Fine Grit 4-1/2 x 1-3/4 x 3/8 x 1/8 SALE! Norton FS-44 India Fine Grit 4 1/2 x 1 3/4 x 1/2 x 3/16 SALE! Norton SS-4 Soft Arkansas* 4x(1 3/4-2)x(3/8-1/2)x(3/16-1/8) SALE! Norton carving tool slips are smaller than round edge slips, and are required for sharpening fine carving tool profiles, and complex molding plane irons. These slips are available in four profiles, in both medium grit India and Hard Arkansas stones. All are the same size, 2 �" X 7/8" X 3/16". Norton MS-12 Norton India Medium Grit SALE! Norton MS-22 Norton India Medium Grit SALE! Norton MS-32 Norton India Medium Grit SALE! Norton MS-42 Norton India Medium Grit SALE! All 4 Profiles Norton India Medium Grit SALE! Norton AS-12 Norton Hard Arkansas SALE! Norton AS-22 Norton Hard Arkansas SALE! Norton AS-32 Norton Hard Arkansas SALE! Norton AS-42 Norton Hard Arkansas SALE! These slips are made in the USA, in Arkansas, of the finest Novaculite available. House Brand AS-12 Hard Arkansas SALE! House Brand AS-22 Hard Arkansas SALE! House Brand AS-32 Hard Arkansas SALE! House Brand AS-42 Hard Arkansas SALE!